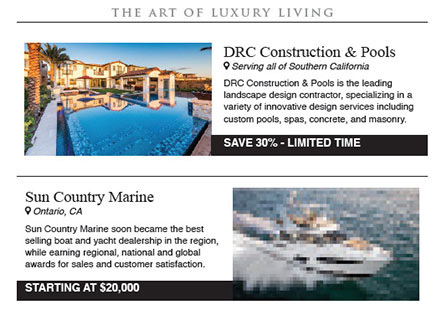 Capture the attention of local, prospective customers with YourVilla Magazine's E-Newsletter or Custom Email Campaign. Promote special offers, events or profile your business and services with YourVilla's weekly subscriber email blasts. YourVilla is reinforced by its company profiling websites which can also serve as a landing page for an email blast. Businesses that advertise in the magazines also appear on the websites and digital editions. YourVilla's Digital Editions are available for the iPad and iPhone through the App Store and iTunes. Consumers can instantly download and view advertisements from our magazine anytime, anywhere. The Digital Editions are also available on the homepage of all 7 Websites. Rates are per run / per zone. *Your Villa Rates are available for Your Villa advertisers only. Monthly and Weekly plans require an annual contract.